Insulation checks: Loose or missing insulation costs thousands of dollars in extra fuel costs per heating season. Use a thermal imager to inspect system insulation and identify insufficient areas. Steam traps remove condensate from heating and process equipment. If the traps fail open, valuable steam is lost. To spot a failed trap, use a non-contact thermal imager , infrared thermometer or a contact thermometer or to compare the temperature of the trap to the pipe on either side of it. Thermography and infrared thermometers hold obvious advantages for traps mounted in awkward areas. Normal temperature differences across steam traps are approximately 20° F.
Proper combustion requires that the combustion air be between proper limits. Use a digital thermometer designed to measure ambient air temperatures and consider checking the carbon monoxide level in the boiler room, as well, to ensure safety. In addition to the steps made above, also check the feedwater temperature, fuel oil heater temperature, and other items such as lubricant. These checks may not only save energy but also costs due to equipment repair or failure. Electrical checks: Check compressor voltage and amperage to ensure that the motor is operating at manufacturer-recommended levels. Temperature checks: Check the temperatures of inlet and outlet air and water temperatures at heat exchangers to verify they are operating at their most efficient levels. Chilled water supply temperatures for most chilled water systems should be between 42 and 44° F.
Pressure checks: Use a digital multimeter with a pressure attachment to take the inlet and outlet pressures of shell and tube heat exchangers, to ensure the tubes are not fouled. Fouling will result in lower heat transfer and higher energy consumption at the compressor. Pressure drop across the heat exchanger (Delta P) may be anywhere from 5 to 25 psig and varies by manufacturer. Check refrigerant and pump pressures, as well, to ensure equipment is operating at baseline levels. Cooling tower checks:For cooling equipment to operate at its most efficient levels, the cooling tower must operate properly. Since cooling towers reject heat at a specific rate to the atmosphere, use a temperature/humidity meter to measure the outside air temperature and humidity and analyze cooling tower operation. Also measure the temperature of the condensing water supplied to the chiller. A common value is 85° F.
Electrical checks: Measure the voltage and amperage of the fan motor and compare to nameplate conditions. Take readings with a handheld temperature meter and compare them against those indicated by the control system to ensure accuracy. 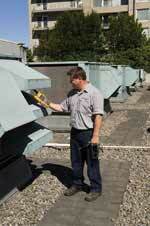 Sensor calibration should be an integral part of all maintenance programs. Air pressure checks: Check pressure drops across filter banks to ensure adequate air flow. Excessive pressure drops will cause higher than normal energy consumption. Measure air pressure drops across heating and cooling coils to ensure that the coils are clean. Measure the inlet and outlet air temperatures to ensure proper temperature rise or drop. Electrical checks:Thermography applications for lighting include ballast and breaker contact temperatures. Look for hotspots and compare values with baselines or previous temperature measurements for evaluation. Illumination levels: Use a light meter to measure footcandle or lumen levels. Where possible, reduce illumination levels to industry standards. Especially consider reducing illumination during seasons when more natural light is available. 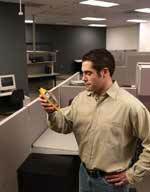 Operational checks: Set up a recording meter to sample illumination levels during a facility's unoccupied hours. This will help identify areas where the lights are left on inadvertently or unnecessarily. Energy consumption checks: Use a power quality meter to evaluate your facility's voltage, current, and KWH energy consumption. If possible, log energy consumption over time on specific circuits, and by specific equipment and areas. Compare your hourly usage rate to your utility fee structure and adjust usage patterns out of high-demand, high-cost times of day. Also check control system supply voltages to ensure proper controller operation. Controller communication bus values may be checked to ensure the integrity of the communication wiring. Control system:Check all sensors and indicating thermometers for properly calibrated gauges. Check valve and damper actuators as well. Actuator problems can cause higher than normal heating and cooling usage and high energy bills. Actuator output voltages and current signals can be checked using a regular digital multimeter. Temperature checks:Check the temperatures of inlet and outlet air and water temperatures at heat exchangers to make sure that they are operating at their most efficient levels. For example, chilled water supply temperatures for most chilled water systems are between 42 and 44° F.
Operational checks: Log air temperature over time, over occupied and unoccupied schedules, identify areas left in the wrong temperature mode at night or on weekends, wasting energy. Setpoint checks: Check the accuracy of all temperature, pressure and humidity control setpoints by logging those values over time. Control inaccuracy may waste 1% of energy per degree of error.